All patterns posted here were created by me. You may use them as much as you like for fun or profit. Please give me credit if asked about them and link to this site when possible. Thank you! You may use and print as you wish but please link back to this page . Gauge: I don't know! 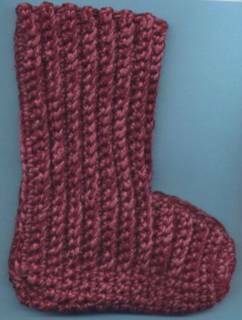 I can tell you that I use a J for ladies size 7-8 shoe and K or N for men, but it also depends on the yarn. Even worsted weights can work up to different gauges, as I am sure you know! Row 1: Sc in 2nd ch from hook and each chain across (58 st.) ch 1 turn. Rows 3-14: repeat row 2, fasten off. Row 25: Sc in back loops working 2 sc together across all sc. (10 st)You can cut the yarn here and drawing the yarn through all toesstitches, pull tight and sew up the front of the boot or join boot together with a sc up the front. I prefer the latter but it doesn't really matter which method you use. You also have a seam to sew up the back. Click Here To Get Free Patterns and More!